Ross Hannah's winner against Hyde coupled with Braintree's failure to beat Barnet earned Grimsby Town a place in the Conference play-offs. Both sides had good chances in a hectic opening but Town went closest when Hannah's fierce shot hit the woodwork. Lenell John-Lewis fired an effort over for the Mariners after the break. And Hyde's defence was breached on 75 minutes when Hannah, who scored a hat-trick against Alfreton, netted from 20 yards for his 15th goal of the season. Hyde, who were relegated in March, went close through Jordan Lazenbury late on. 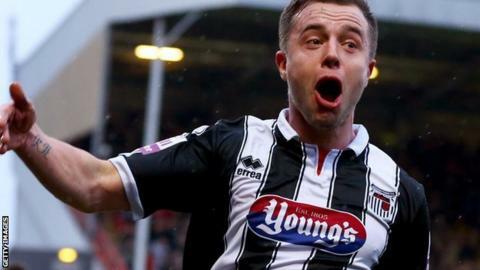 But Grimsby held on and are third, a point ahead of Halifax and Gateshead. "I think from that performance it can't be anything but nerves from the players. No matter what I say when they are out there it's hard to change that. "Of course people say they should be able to handle it and I am not going to say they can't or they shouldn't but it was hard to watch one or two players because it certainly looked like the confidence had been drained from them. "We have got one game left for definite, hopefully we've got another four but I am not too concerned, I think it's another kettle of fish next Saturday depending obviously how we need to go there." Match ends, Grimsby Town 1, Hyde FC 0. Second Half ends, Grimsby Town 1, Hyde FC 0. Foul by Adam Blakeman (Hyde FC). Ross Hannah (Grimsby Town) wins a free kick. Attempt saved. Ross Hannah (Grimsby Town) right footed shot from the centre of the box is saved. Attempt missed. Liam Tomsett (Hyde FC) right footed shot from outside the box misses to the right. Substitution, Grimsby Town. Jamal Fyfield replaces Scott Neilson. Foul by Joe Colbeck (Grimsby Town). Foul by Rhys Day (Hyde FC). Oumare Tounkara (Grimsby Town) wins a free kick. Attempt saved. Jordan Lazenbury (Hyde FC) right footed shot from outside the box is saved. Attempt missed. Jordan Clark (Hyde FC) right footed shot from long range on the left misses to the right from a direct free kick. Foul by Sam Hatton (Grimsby Town). Jordan Clark (Hyde FC) wins a free kick. Foul by Jordan Lazenbury (Hyde FC). Attempt missed. Oumare Tounkara (Grimsby Town) header from the centre of the box is too high. Assisted by Scott Kerr. Attempt saved. Oumare Tounkara (Grimsby Town) right footed shot from the left side of the box is saved. Goal! Grimsby Town 1, Hyde FC 0. Ross Hannah (Grimsby Town) left footed shot from outside the box to the bottom right corner. Assisted by Oumare Tounkara with a headed pass. Offside, Grimsby Town. Scott Neilson tries a through ball, but Scott Neilson is caught offside. Offside, Grimsby Town. Ross Hannah tries a through ball, but Ross Hannah is caught offside. Attempt saved. Joe Colbeck (Grimsby Town) right footed shot from the right side of the box is saved. Substitution, Grimsby Town. Joe Colbeck replaces Aswad Thomas. Substitution, Grimsby Town. Oumare Tounkara replaces Lenell John-Lewis. Attempt missed. Lenell John-Lewis (Grimsby Town) right footed shot from the centre of the box is too high. Assisted by Sam Hatton with a cross. Substitution, Hyde FC. David McNiven replaces James Kirby. Foul by Liam Tomsett (Hyde FC). Substitution, Hyde FC. Jordan Lazenbury replaces Alex Brown because of an injury. Attempt missed. Lenell John-Lewis (Grimsby Town) right footed shot from outside the box misses to the right. Attempt missed. David Poole (Hyde FC) right footed shot from outside the box misses to the left. Attempt missed. Ross Hannah (Grimsby Town) left footed shot from outside the box is too high from a direct free kick.